To commemorate the MSP University bootcamp being held right now, I’ve got a special giveaway for anyone who couldn’t make it out to California. Three lucky winners will receive their very own copy of The Guide to a Successful Managed Services Practice (MSRP $99.95) written by none other than Erick Simpson, VP/CIO of MSP University. 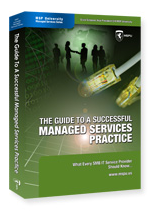 To enter, simply complete this super-short survey on managed services. I’ll draw book winners at random from all the entries received by 11:59 PM Central time on August 16 AKA this coming Sunday. Also, anyone who enters now is automatically entered in all of the upcoming giveaways, which officially kick off Monday, August 17 and run through the end of this month.